CCSSE and SENSE data provide colleges a great deal of information to help identify strengths and areas in need of improvement in the work of increasing student success. These data deliver the "what" about the student experience, but through focus groups, colleges can also learn the "why." In addition to gathering specific detail about the experiences students and others are having, these structured discussions will also help uncover possible strategies to consider for improvement. 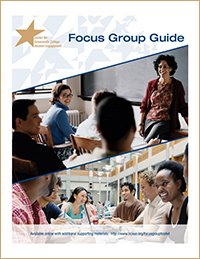 The Center's Focus Group Toolkit, which includes the Focus Group Guide at right, details the Center's approach to organizing focus group discussions with community college students, faculty, and staff. The Toolkit also includes the discussion guides below, which are based on topics relevant to the community college field.